The Galvanized Steel Candelabra is created from 1/2 inch galvanized steel pipe fittings which form a simple and raw industrial object. 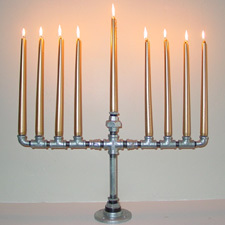 Originally designed as a Menorah for the seasonal Jewish holiday of Hanukkah, the candelabra holds 9 candles. The artwork measures 20 1/2 inches long by 13 inches high, weighs 5 1/2 pounds. The Galvanized Steel Candelabra was included in an exhibition entitled Reinventing Ritual: Contemporary Art and Design for Jewish Life at The Jewish Museum in New York City from September 13, 2009 to February 7, 2010 and at the Contemporary Jewish Museum in San Francisco from April 22 to September 28, 2010. The exhibition mapped the 21st century avant-garde expressions of design in Jewish ritual objects. In 2016, Shmaltz Brewing Company featured artwork based on this candelabra for their annual Chanukah, Hanukkah: Pass the Beer seasonal release.